All are welcome to join and participate in the association. You do not need to do anything more than join one or more of the TPA6 events that will be announced on Mondays. In addition to being part of TPA6, this is also the ninth tournament in my series based on my original homeland -- Czechoslovakia -- and Oneyed's excellent map of it. Each of the 25 tournaments in this series celebrates some aspect of a different town or city on the map, and matches it to some game type or setting on CC. For more information on my CSFR series visit the DKs CSFR Frag series Infocentre. This tournament focuses on the town of České Budějovice and its most famous export, beer. České Budějovice (Budweis in German and English) has been a major beer-brewing centre since its founding in 1265. The Czech king at the time, Otakar II, needed a Czech power base in southern Bohemia to compete with the powerful German families in the area. One of the privileges that he gave the new town in its founding charter was the right to operate a brewery. From there, the influence of Budějovice in the beer brewing industry grew steadily. Its charter was affirmed and extended by many Czech kings and Holy Roman Emperors, including Charles IV, Wenceslaus IV, Ferdinand I, and others. Both German and Czech breweries operated in Budějovice, both using the term "Budweiser" for their beer, based on the German name for the town. At various times the municipal breweries had a royal monopoly in the region. Ferdinand I made Budweiser the official beer of the Holy Roman Empire. Budweiser was exported throughout Europe from the 14th century onward. In 1872 the first exports to the USA began. Noting the popularity of the beer, Adolphus Busch, founder of the Anheuser-Busch Brewing company, started marketing a similar Bohemian-style lager beer in 1876. He named the beer "Budweiser" after the import that it was imitating. Soon afterward, he registered the trademark "Budweiser" in the United States, and, in what many people consider adding injury to insult, started legal actions to enforce his trademark rights against the original import which he was copying. 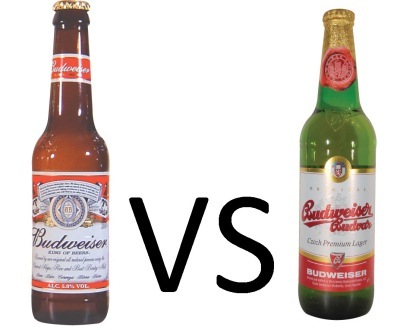 Since then, the Budweiser vs. Budweiser trademark dispute remains one of the largest and longest ongoing legal wars ever fought. A treaty in 1907 was supposed to resolve the dispute, granting Annheuser-Busch the right to use the name in America and Budweiser Budvar Brewery the right to use the name in Europe. This was not, however, the last word. More than 100 separate legal battles have been fought. Following the broad outline of the 1907 treaty, Annheuser-Busch currently is the recognised trademark holder in most North American countries and Budvar Brewery is the recognised trademark holder in 23 of 27 European Union countries. Many outstanding issues exist and disputes continue. In countries where Anheuser-Busch sells Budweiser, Budvar Budweiser is sold as just "Budvar", while in countries where Budvar's Budweiser holds the trademark, Anheuser-Busch's product is sold as "Bud." Ever since Ferdinand I made Budweiser the official beer of the Holy Roman Empire, it (the original) has been known as "The Beer of Kings." Anheuser-Busch adopted the slogan "The King of Beers". They say imitation is the sincerest form of flattery. Due to game load only premium players will be allowed. The tournament requires at least 55 players, and will allow a maximum of 75. Sign-ups will remain open until either we reach 75 players or sign-ups have been open at least two weeks and we have at least 55 players. Each phase will have two movements. In each phase you will play in at least six games and usually more. The games on the larger USA Great Lakes map will be 7-player. The winner of each CSFR game will choose most of the settings, with some restrictions. All games must be Standard. There can be no freestyle and no speed. At least two of the four major variables (spoils, forts, fog, trench) must be the same as on the game you won. Round limits can only be chosen from 20, 30 or 50. Your opponents will be re-randomized in the second half of the phase, and to create the larger 7-player games I will randomly conscript people to play more than three games. Conscription will also be used to fill vacancies if people fail to accept invites and there are no reserves left on the reserve list. Bonus points for multiple victories: 1 point for 2nd victory in a single phase, 2 points for 3rd victory, 3 points for 4th victory, etc. Points will be imperfectly cumulative. Before each phase, everyone's cumulative score will decay by 20%. After Phase 2, eliminated players will be asked to remain in the conscription pool to balance out the numbers for the USA Great Lakes games. I will be applying for a special GA medal: All players who agree to remain in the conscription pool after being eliminated, and win at least one game they have been conscripted into, will go into a final playoff series for the GA medal. The precise size and composition of the playoff series will be decided once I know how many players have qualified for it, and it will be played simultaneously with the final rounds of the regular games. In the final round, there will be no conscription, and the USA Great Lakes games will be only 5-player. Dukasaur wrote: I'm thinking of reducing the total number of rounds from 8 to 6, and increasing the number of eliminations. After this round (Phase 3) reduce down to 20 players. After Phase 4, reduce to 10. After Phase 5, reduce to 5. To replace players who fail to accept invites after games have been created. Conscription will not be used to replace players who resign or drop out before games have been created. That will be done by curbing the elimination of players who would otherwise have been eliminated by their score. Players who are eliminated will be asked to remain in the conscription pool, and to reward them I am planning a special playoff series and am applying for a GA medal for the winner of that series. This is my 123rd tourney. Phase 1 wrap-up post including leaderboard and eliminations can be found here. mikehayes, waauw, and serram win one each, in that order. Code_RED, grt, and MTTW win one each, in that order. Hardwood, Kid Moe, and Silly Knig-it win one each, in that order. Fewnix wins all three games. djelebert, paws, and ScaryTeded win one each, in that order. Tin Trumpet wins the first 2 games, Gawddog the third. danervinsucks wins the first game, shoop76 wins the other two. ** NOTE** kkelly replaces donche64. iAmCaffeine wins Strat Add fog. What's the similarity between Budweiser (the American one) and making love in a canoe?